The school began with a Board of Directors being elected December 1969. The first board was made up of the following: Dr. James S. Poole, President; Dr. R. J. Field, Jr., Vice President; Mrs. S. E. Field, Sr., Secretary; Mr. Allen Rollins, Treasurer; Mrs. E. B. Robinson, Sr.; Mr. W R Trask; Dr. Warren Dye; Mr. Joe E Brian; Mr. William H. Smith and Mr. Donnie Nutt. The first Headmaster was Mr. Hillery Horne. The date of January 19, 1970, the first classes were held in the local churches and the office was located in the Archer House next to the Presbyterian Annex. Our beginning faculty members were Mrs. Louise Johnson, First grade; Mrs. Jerry Lucas, Second grade; Mrs. Ann Netterville, Third grade; Mrs. Lucille Anderson, Fourth grade; Mrs. Ruth Trask, Fifth grade; Mrs. Janet Etheridge, Sixth grade; Mrs. Roma Fern Germany, English; Mrs. Minna Erstling, Science; Mrs. Willadean Robertson, Commerce; Mrs. Charlotte Redhead, Math; Mrs. Ruth Smith, English and Librarian; Mr. Jimmy Randall, Social Studies; Mrs. Katherine Chapman, Home Economics and Mr. Al Moore, Coach. Centreville Academy’s first graduation was May 26, 1970, at the Centreville Baptist Church where 27 graduates received diplomas. 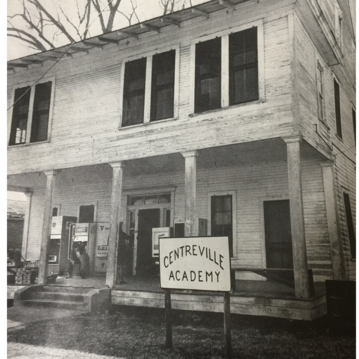 Formal groundbreaking ceremonies were held on May 7, 1970, at the site of Centreville Academy today located at 1419 Academy Street. Thirty-one acres were initially given by several generous individuals. The two buildings, Elementary and High School, were constructed first and dedicated on September 27, 1970. The cost of the two buildings plus the furnishings and equipment was approximately $94,000.00. The gym (served as cafeteria and auditorium) was built between the two buildings and joined with covered walkways and a large patio in the spring of 1971 and the cost was approximately $60,000.00. There were a lot of dedicated volunteer workers to help construct the buildings and that has continued to be an asset to maintaining Centreville Academy as a progressive educational facility to this day. Additional facilities have been established through the years being a lunchroom, weight room, and football and baseball field houses. A press box has been added for baseball, football, softball, and track. Four concession stands are equipped to handle many varieties of foods for sale during game times. A set of beautiful bleachers were added to the visitors and the home side of the football field and of course, there are adequate bleachers for the baseball and softball field. With the athletic facilities being updated along came some great coaches and players to give us nine football State championships, one State Boys track championships, 5 State Girls track championships, 3 Back to Back State softball championships and 2 baseball State championships. We received recognition when Coach Bill Hurst broke the record in 2013 for the most wins of a football coach in the history of Mississippi for 347 games. Academically we have excelled through the years with Science Fairs winning 7 of 11 years the School of Excellence Award, Quiz Bowls, Spelling Bees, Math Bowls and Academic Betterment Competition. Our school is a member of the Southern Association of Colleges and Schools along with membership in the Mississippi Association of Independent Schools. It is great to have some of our former graduates holding positions of lawyer, physicians, certified public accountants, banking officers, school and hospital administrators, teachers, nurses, engineers, architects and many other note worthy professions. As of May 2016, we have graduated a total of 1,764 students from Centreville Academy. We give praise to God first for this fine educational institution and then a big thank you to the many parents, teachers, students and volunteers that have made it what it is for the past 45 years. Centreville, Mississippi, also known as Elysian Fields was founded during the Second Spanish Regime in Mississippi, which, according to the meager records found, must have lasted from 1781 - 1798. Old Centreville, or Elysian Fields, was known for its giant pines, spreading live oaks, luxuriant magnolias, rippling streams and bubbling springs. Elysian Fields means "Seat of Delight," "Seat of Future Happiness," "any delightful place." Centreville rests in Wilkinson and Amite County. Wilkinson County was formed in 1802 and Amite County in 1809. Elysian Fields or Amite Courthouse was founded during the Second Spanish period as a Spanish trading post. The Amite County Court was sometimes held under the great live oaks at the crossroads. The Amite County early settlements are always mentioned in connection with roads. The historic Three-Chopped Way led from Georgia to Alabama to Natchez, Mississippi. It came through Liberty and veered northwest, so it is reasonable to suppose it came through the Spanish post-Elysian Fields. A register of officers and agents of the United States in 1817 in Mississippi Archives and History mentions a second road. "In 1818 a road was listed from Natchez to New Orleans. It crossed Homochitto River, crossed the 31* N parallel, crossed Amite River, went by the courthouse in St. Helena Parish, Louisiana, and crossed over the bridge on Tangipahoa River." A note in the Orphan's Court record in Liberty adds: "From the direction of this road it undoubtedly came through Amite County or a portion of it. It doubtlessly passed through Elysian Fields, as this was said to be a relay station for Spaniards and other settlers of the section." This same road is again described in the W.P.A. Project as: "Leading through Williams Settlement and crossing Beaver Creek at Elysian Fields, which probably received its name from Elysian Fields Road. As far as can be ascertained, this road led from Elysian Fields to New Orleans. The Old Moore Place, one mile east of Centreville, was the site of this early settlement, and it is said to have been a relay station and a trading post for the early settlers." This road which is part of which led from Liberty to Woodville followed what is now Cherokee Drive, which goes west by Mrs. Ollie Graves' place and east past William Winans Institute to intersect with the C. N. Gallent Road. This Road from Natchez to Liberty led on to the forks of Amite River, then navigable, where travelers could take a boat at Fort Hazard for New Orleans through Lake Pontchartrain. There was at one time a stage, or coach, that ran from Liberty to Woodville, and perhaps beyond. Here then, at the crossing of roads, the town that is now Centreville began to grow.